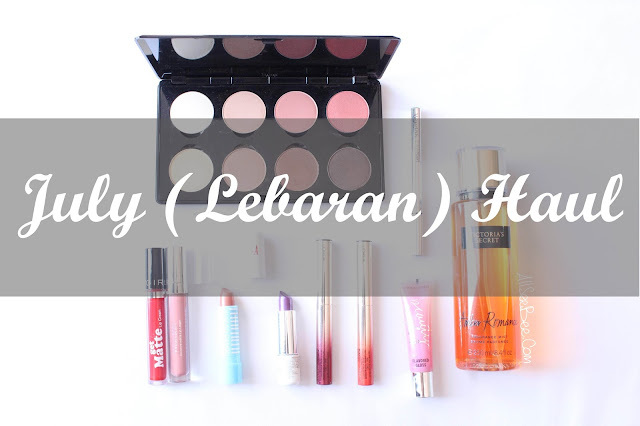 This is the first ever beauty haul that I ever write on my blog. If you read my blog since the beginning times I start beauty blogging around three years ago until today, you will hardly find a post about beauty haul. Hahaha, yes, I never really buy lots of beauty product every month. Mostly, I only repurchase my daily needs such as liquid body wash, face wash, shampoo and conditioner. Nothing fancy about them. Just regular products that you can easily find at minimarket or supermarket. Therefore, I never make a post about it. Of course I buy others decorative beauty products such as lipstick, lipstick, and sometimes other stuff. Hahaha, seriously, I've bought lots of lip products lately. Don't worry, I also did the research before I made this post so I didn't mislead you with the words I used in this blog. Okay, let's focus on this post, shall we? These are products that I purchased during last July and Lebaran. Not much, but it successfully made me feel shopaholic for some reasons. First thing first, the lip products! As you can see, one of two biggest products in the picture is this Victoria's Secret Fragrance Mist in Amber Romance. I did a collective purchase with my sisters and cousin for this Fragrance Mist because Victoria's Secret has a special promo at that time. There was a funny story behind this Fragrance Mist. Victoria's Secret has a lot of fragrance mist to choose and my sisters, my cousin and I had a little bit overwhelmed while we tried to pick our own. So, we ended up trying every fragrance mist on the papers VS provided and every time we got confused, we spray the fragrance mist on to the new paper and we ended up with a bunch of paper once we finish. The Amber Romance that I picked has a sweet yummy scent in it. As I looked on to VS's website, it has Amber and Crème Anglaise scent in it, which is why it has sweet yummy scent as I mentioned earlier. The only eye decorative product that I purchased is this Wardah EyeXpert Optimim Hi-Black Liner. I read and heard lots of good impression on it, so I would like to give it a try. Last but not least, the other big product that I purchased is Make Over Professional Highlight & Contour Palette. I put a lot consideration before I purchase this baby. Not only because of the money but also the function itself. I find it multipurpose for some reasons. So, how do you think about my July a.k.a. Lebaran haul? Is there any products that you want me to give a full review? Please let me know!